Researchers have found that the sun's magnetic field allows the release of wave energy from its interior, permitting sound waves to travel through thin fountains, or "spicules", upward and into the chromosphere. The chromosphere is the region of the sun that looks like a red ring of fire during an eclipse. 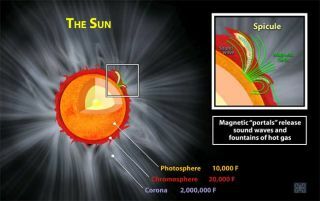 HONOLULU—Sound waves can hitch a ride along magnetic fountains that shoot out from inside the Sun and help to heat up the solar atmosphere, according to a new study presented here at a meeting of the American Astronomical Society. Long thought to be trapped in the Sun’s interior, energetic sound waves can actually leak out through magnetic portals. "The Sun's interior vibrates with the peal of millions of bells, but the bells are all on the inside of the building," said lead researcher Scott McIntosh of the Southwest Research Institute in Colorado. "We've been able to show how the sound can escape the building and travel a long way using the magnetic field as a guide." The new findings shed light on a decades-old mystery as to why the Sun’s atmosphere is so much hotter than the visible surface of the Sun. "It's getting warmer as you move away from the fire instead of cooler, certainly not what you would expect," said McIntosh. While the Sun's visible surface is a steamy 10,000 degrees Fahrenheit (5,538 degrees Celsius), the chromosphere, a thin layer of plasma sandwiched between the visible surface and the Sun’s outer atmosphere called the corona, soars to 20,000 degrees Fahrenheit (11,100 degrees Celsius). And the corona reaches temperatures of more than 100 times hotter than the Sun’s surface. The chromosphere appears as a ruby-red “ring of fire” around the moon during a total solar eclipse. Understanding how this layer is heated has implications for Earth’s climate, as this “ruby” chromosphere is responsible for the deep ultraviolet radiation shining down on our planet. In the past, scientists have used the Sun’s sound waves as a window into the solar interior, where the sound waves are trapped by the star’s visible surface, called the photosphere. The Sun’s “interior is flooded with these energetic sound waves,” McIntosh said. “These waves are not your garden-variety sound waves.” For one, they have extremely low frequencies, making them inaudible to us. “They also pack much more of a punch than regular sound waves,” McIntosh said. The energy would be equivalent to about 2,000 Watts per square foot. With observations from solar observatories along with computer simulations, the scientists found the Sun’s magnetic field lines act as portals through which this wave energy can travel upward and into the solar chromosphere. The leaking sound waves revealed themselves as jets of hot gas called spicules, which overcome about 27 times Earth’s gravity to form fountains extending thousands of miles above the Sun’s surface. It’s the sound waves, the scientists say, that propel the hot fountains. Images of the Sun’s atmosphere showed “twinkling lights,” which McIntosh said represented the opening and closing of the portals, through which the waves—and the plasma fountains—could escape the solar interior. The shuffling and reorganization of the Sun’s magnetic field lines (which happens constantly) directs the opening and closing of these magnetic portals. "The constantly evolving magnetic field above the solar surface acts like a doorman opening and closing the door for the waves that are constantly passing by," said one of the researchers, Bart De Pontieu of the Lockheed Martin Solar and Astrophysics Laboratory in California.